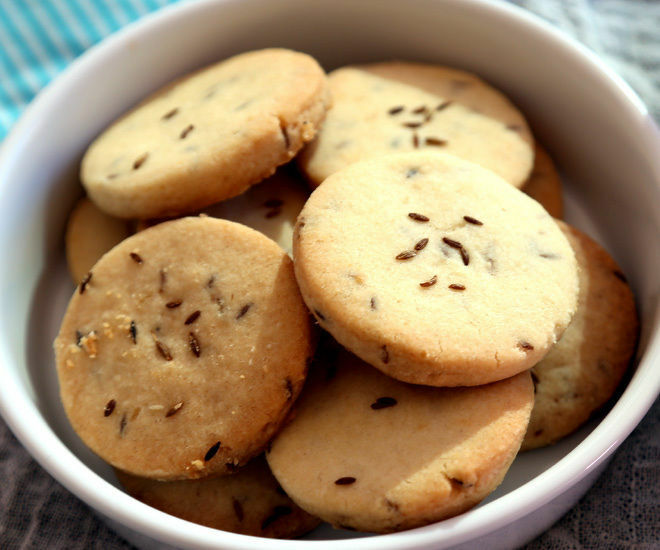 Cumin cookies or jeera/zeera (hindi name for cumin) biscuits as we call them in India are ideal for tea time. Little sweet and little salty, I love to dip them in my chai, so yum! I have tried making these cookies before but somehow they never tasted the way I wanted them to and so I tried and tried again and finally I found a recipe which was just perfect. This will be my “to go” recipe for cumin cookies from now on. These cookies are very different in texture from the ones we get in USA. Basically in India we call these “biscuits” and not cookies. Biscuits are supposed to be crunchy and crispy, on the other hand cookies in USA are soft and chewy. It’s funny how the same term has different meaning in different countries. 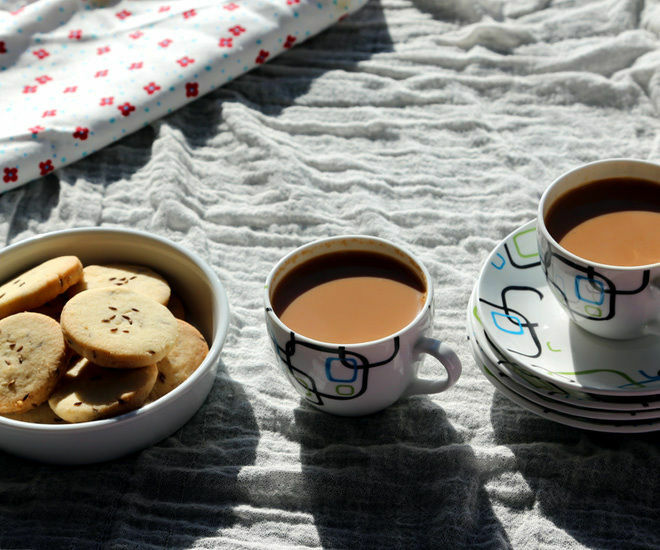 Biscuits in UK/India are hard, crispy and dry whereas biscuits in USA are soft and flaky. 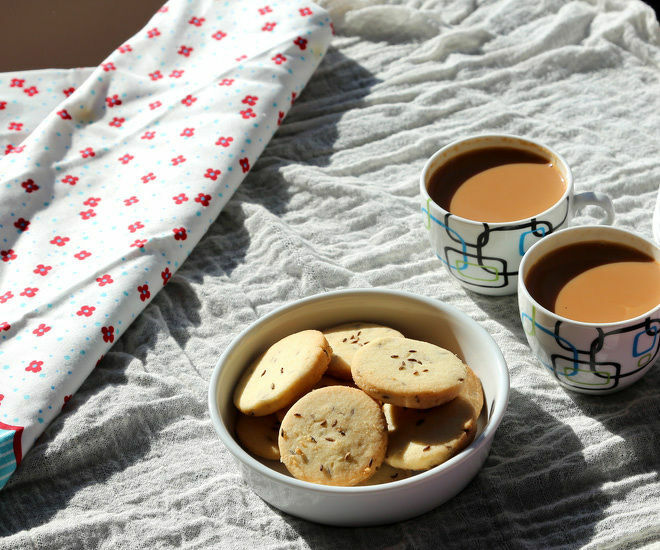 These cookies are great with tea and so I made them crispy and baked them for a longer time. I baked till the edges were nice golden brown in color. If you are not a fan of crispy cookies and want them to be on the softer side, bake them for a less amount of time. My husband has been asking me to bake these cookies for days as he loves to dip them in tea and I finally got around making them and the best part was that they came out so well that now he can’t stop eating them! 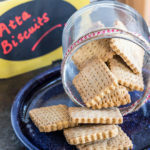 I bet they taste better than the store bought jeera biscuits and they are so easy to make. So try these out and I assure you won’t be disappointed. 1. In a baking tray, take 1 tbsp of cumin seeds and roast them for 3-4 minutes at 350 F degrees or till you get a nice fragrance from them. Set aside. 2. In the steel bowl of your stand mixer or using your hand mixer, cream together the butter and sugar. Scrape down the sides and bottom of the bowl as needed. 3. Add the flour, salt and 3/4 tbsp of cumin seeds to the butter and sugar and mix. Reserve the remaining cumin seeds to sprinkle on top of the cookies. Mix at low speed till the mixture looks smooth and comes together in form of a dough. You may add 1-2 tablespoons of milk here if the dough doesn’t come together. 4. Sprinkle some flour on a flat surface or wooden floor and shape the dough like a flat disc. 5. Using a roller, roll the dough to 1/4 inch thickness. Cut into different shapes using cookie cutter. I cut them into small round cookies. 6. Place the cookies in a baking tray and bake at 350 F degrees for 10 minutes. After 10 minutes, take them out and reduce the temperature to 325 F and bake the cookies again for 5-6 minutes or till light they are golden brown from sides and also from the bottom. The reason I baked them for a longer time was because I wanted crispy cookies for my tea. 7. Place on wire rack to cool completely. 8. Store the cookies in an airtight container. 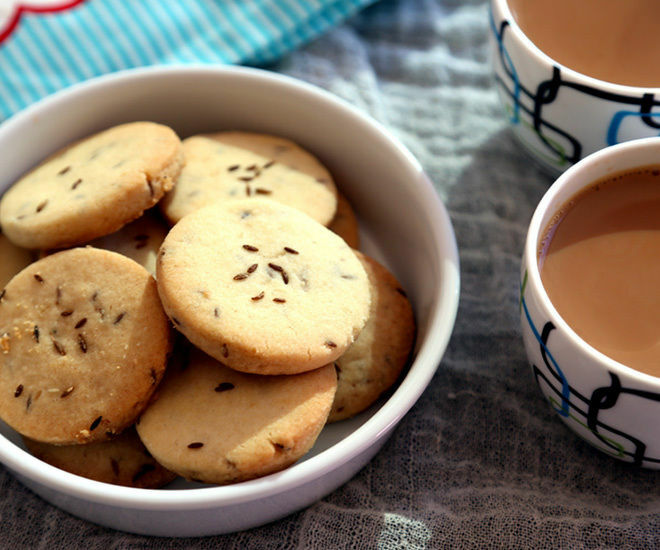 Enjoy the sweet and salty cumin cookies with tea! EDIT: Some of you face the problem in getting the dough together. In that case, add 1-2 tablespoons of water or milk. Start with 1 tablespoon of water/milk and add more as required to bring the dough together. * If you want softer cookies, bake them for a lesser time, around 10 minutes. * If you want crispier cookies, bake them for some more time. * You can cut down the sugar and increase the salt if you want the cookies to be more salty. This was just about perfect for me. * I used a small cookie cutter and ended up with 20 cookies but if you are using a bigger cutter, you might only be able to get 8-10 cookies out of this dough. 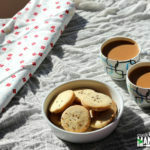 Sweet and salty cumin cookies, perfect with tea! In a baking tray, take 1 tablespoon of cumin seeds and roast them for 3-4 minutes at 350 F degrees or till you get a nice fragrance from them. Set aside. In the steel bowl of your stand mixer or using your hand mixer, cream together the butter and sugar. Scrape down the sides and bottom of the bowl as needed. Add the flour, salt and 3/4 tbsp of cumin seeds to the butter and sugar and mix. Reserve the remaining cumin seeds to sprinkle on top of the cookies. Mix at low speed till the mixture looks smooth and comes together in form of a dough. You may add 1-2 tablespoons of milk here if the dough doesn't come together. Sprinkle some flour on a flat surface or wooden floor and shape the dough like a flat disc. Using a roller, roll the dough to 1/4 inch thickness. Cut into different shapes using cookie cutter and sprinkle them with the remaining roasted cumin seeds. Place the cookies in a baking tray and bake at 350 F degrees for 10 minutes. After 10 minutes, take them out and reduce the temperature to 325 F and bake the cookies again for 5-6 minutes or till light they are golden brown from sides and also from the bottom. Hi man alive , my cookies are in the oven but just now realised there was no baking powder or soda…..will it still turn fine??? Hi manali *..sorry iPads auto texting..
they should turn out fine Zafira…these cookies don’t need baking powder or soda! i saw your site three days back and thought of trying jeera cookies. OMG is the best word i want to say. i am never confident when i am baking cookies (I am a home baker). But this time …it was amazing , easy recipe , easy method and they turnout so beautiful and sooooo yummy. surely will try more of your recipe. Thank you so much for this delicious recipe! 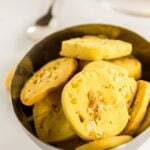 For me it was a very uncommon idea to put cumin in a sweet treat – therefore I had to try it and I am sure that I will make those cookies again. And again. And again. What equipment/appliance can be used for mixing other than stand or hand mixers? Will hand blender do the job equally well? Hi Rashmi! You can use a simple wire whisk if you don’t have a stand/hand mixer. Whisk will be fine for making simple cakes/muffins etc. The stand mixer just makes the job easier especially if you do a lot of baking! Hello Manali, I am planning to try these and your mango yogurt popsicles. They looked too good to pass! 🙂 It’s my first time here and I am sure I would come back! Hello Ria, Thanks for dropping by! Please let me know how they turn out 🙂 and I just checked, you have a great blog! I was looking for eggless cumin cookies and this recipe made my day:) as everyone likes it. and your comment made my day Rupali! 🙂 Thanks a lot for your feedback and you are so very welcome! Thanks for the recipe. I tried it and it tasted very good. but I had one issue in the process. The dough was very dry and wasnt at all binding together even when the butter was at room temperature which had it impossible for me to roll it. hence i had to finally had to add some egg white to it. what would have gone wrong? Please advise. Sabrina, as I have mentioned in the recipe, please add milk to bind the dough if it doesn’t come together. The dough comes together with a stand mixer but not with a hand mixer. And if it doesn’t come together even with a stand mixer, add milk 1 tablespoon at a time till it comes together. Hope this helps! Tried these today morning and they turned out to be VERY TASTY! 🙂 i think the proportion of ingredients that you so painstakingly perfected is actually superb! Loved the balance of salty and sugary flavors. I had to add couple of tbsp milk to bring it together. Made double the quantity and my family is delightfully relishing it. Thanks again. Aww thank you! your comment made my day, I’m so happy the cookies turned out well 🙂 Thanks for the feedback, means so much! This is supreep from IL :). You have a great food blog. Just wanted to know if you have wholewheat version of cookies. I really like jeera cookie but I see that you have used APF for making it. I would like to make it with Wholewheat flour. Please share the recipe if you have one. Hi Supreep, thanks so much for visiting my blog! 🙂 You can just replace APF with WWF in this recipe supreep, I am not sure about the texture but you can give it a try. Also you might need to increase the baking time when baking with whole wheat. Hope this helps! I tried these with whole wheat flour 1cup and 2tbsp AP flour and 1/4tsp baking powder. Had to add a little more water to get the crumbly dough together. But it rolled fine and the result was great. Buttery, crispy, sweet and salty. me and my family LOVED this recipe! the result was exactly what i was looking for! the classic bakery biscuits! there are many other recipes that might work but friend YOU made my life easy when you gave the ingredients in cups and spoons (US) measurements! since i dont have a weighing scale – besides i like the cups measurements! so hassle free. so quick, classic and DELICIOUS recipe!!! thank you! 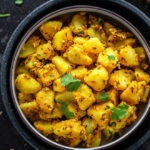 looking for more great recipes from you! i made these today and they turned out amazing! The taste was just as i like it. Sweet and salty both! Awesome! Not sure if you already answered this but is there a substitute for butter in this recipe. I love jeera cookies but the ones in Indian stores are so rich. Just wondering if I can make these with vegetable oil instead of butter! Thank you Mansi, I am so glad you liked them! yay!! Just tried the Cinnamon cookies and they came out well.! Planning to try some more cookies ! Will try once again with less baking time!! Hello Jasmine, thanks for the feedback! Well yes that is why I say that every oven is different, temperatures are off by 15-20 degrees and that can make a huge difference. So you have to adjust accordingly, bake for less time when you try them next! I made these today and absolutely love them. My 18 month old son is right now standing in the kitchen asking for more. Fabulous!! Hey hi the recipe does not have baking powder and I am a biginner so can you guide me will it be okay? I mean how will the batter rise? Hello Aayushi! You don’t need baking powder or soda in this recipe. These are flat crispy Indian style cookies so they don’t require leavening agent, the batter doesn’t have to rise here. yes 1/2 cup is 8 tablespoons of butter and yes sugar is 5 tablespoons. You may reduce the sugar if you want. Hi Manali ma’am.. I need your help once again. I want to make cupcakes and i do paper cups for it but I don’t same design tin liners for it. So should i put batter into papaer cups directly and then straight to oven tray or I have tin liner which is shallow and not that deep as the paper cup so should I use that. The second alternative can be using 2 3 papercups liner for each cupcake so what should i do please suggest the best alternative. Aayushi, first of all place the cupcake paper cups into the tin pan. then fill the liners with batter and bake. You can also pour batter directly into the pan and not use paper liners but in that case make sure to use a good non-stick spray. Spray the entire pan and then pour batter. If you use paper liners, then you don’t need to do this. Hope this helps! Yes thanks but my liners n tin are of different shapes so will there be any problems. I mean my tin shallower and wider than the paper cups. there shouldn’t be much problem! If you think it just won’t work, just skip the liners and pour batter directly into the tin and don’t forget the nonstick spray! 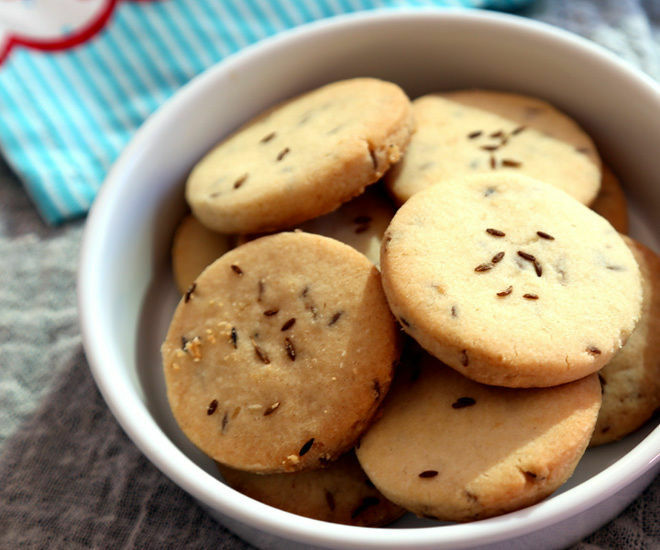 U have nice recipe.but in my recipes.i have not gotten good colour of jeera cookies.i dont know why if i decreased time of my oven then its taste is like half baked.if i give proper time with temperature it will dark.plz solve this problem . U can freely whats app with me on 9896052055. Hello Ankur, every oven in different. You need to check your oven temperature settings. Please bake for a longer time if the cookies aren’t getting done in the mentioned time. Thanks for sharing the recipe. Turned out very well. Like many others, the dough needed about 2 Tbsp of water in order to roll it out. Glad to hear that! You are welcome! I can not stop eating these cookies !!! I am glad to hear that Kiraz! Hi Manali. I don’t have a stand mixer. Can i knead the dough with my hand like we knead aata for making rotis? Made this last weekend and they were awesome. All gone already. 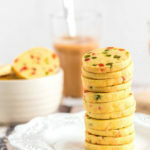 Do you have a recipe for masala biscuits? Hi Shallu, you can make them with whole wheat flour, there will be a difference in texture though, the cookies will be denser! Oh wow. I made these and they are too delicious I don’t want to share. Thank you so much for amazing tasty recipe. Far tastier than ones I buy! I am glad to know Manjula! They are my favorite too, especially with chai! Hi , i tried these and were amazing. I have never tried to make this savory so I cannot comment on how it would turn out. If you want, please go ahead and skip the sugar. Add more of salt and all the seasonings that you want and see how it goes. Let me know! Hi Manali, I love it, thank you so much this recepie! Welcome Gita, glad you liked these! How many minutes should the oven be preheated? the temperature is mentioned in the recipe, it should be 350 F degrees. Pre-heat for 10 to 15 minutes. These are great. The base recipe is very good, but for my own tastes I used cultured butter, tripled the salt using fleur de sel (hand harvested flake sea salt – I wouldn’t do that with regular table salt) and also added an extra Tbsp of sugar. And I used gluten free flour, which worked great. I refrigerated them before baking, which really helped the jeera flavor to permeate the dough. Your readers who are having trouble with it not coming together might try weighing the flour instead of scooping it – 160 grams is the equivalent. Too much flour is probably the culprit! I weighed the flour and the consistency of the dough came out perfectly. Next time I might also try chilling the dough in small logs, rolling them in a mix of salt and sugar, and then slicing thin so they have a little ring of salt and sugar. Yum! Cookies look lovely. Can you please tell me if we can use wholemeal flour as a subsitute or even if we can do half wholemeal and half white flour? You can do half whole wheat and half white flour! I so wish you are still responding to questions on this post. Thank you for this lovely recipe. I dont own an oven right now. Do you have any experience with oven less baking? I have been successful with cakes but that has leavening agents like soda and baking powder. This recipe does not calls for that. However I am not use to the US metrics. I have nothing to measure it in cups. I have searched on the web but not all the figures come out the same when converted into grammes.. .
Could you please help me out and share the recipe in grammes ? Hii want to try this out but can u plz give the proportions in gms. Delicious and crunchy. I made mine with margarine instead of butter by the way – still great.